Pressure is growing on Pelosi to relinquish her role. But will she? WASHINGTON — It seems like almost every other day, yet another Democratic House candidate says they won’t support Nancy Pelosi if elected. The latest one: Rashida Tlaib, the Michigan Democrat who’s poised to become the first Muslim woman in Congress. “She doesn't speak about the issues that are important to the families of the 13th congressional district, and they are a priority for me,” Tlaib said of Pelosi yesterday. 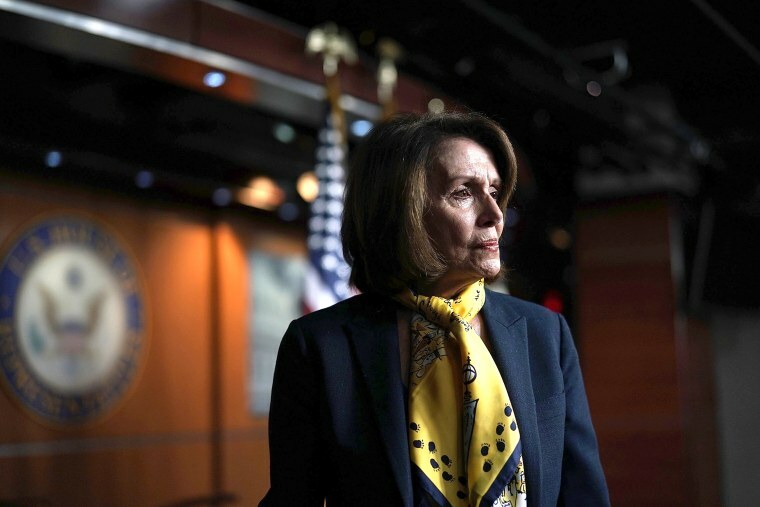 In fact, our own Ali Vitali and Jack Bohrer report today that at least 50 Democrats now say they won’t back Pelosi, including 41 House nominees and nine incumbents. The mounting count of Democrats on the record opposing her begs the question: Will the pressure on Pelosi become so great that she has to say before the election that she won’t seek the speakership? Of all the important states for 2018, Florida may be the one where all the national trends — anti-Trump outrage in urban and suburban areas, Trump loyalty in red inland counties, and general frustration with government dysfunction at both the state and federal level — seem to be canceling each other out, putting the focus more squarely on candidates and issues themselves. That’s why we paid special attention to developments in the Florida Senate race this week, which may end up being the most consequential contest for the upper chamber. Here’s the latest on the ongoing count in KS-GOV, via the AP: “Kansas Secretary of State Kris Kobach said Thursday that he will remove himself from the further counting of votes while his Republican primary battle with Gov. Jeff Colyer hangs in the balance, describing it as a "symbolic" step in response to a public demand from Colyer. The governor publicly accused Kobach, the state's top elections official, of giving county election officials information about the handling of yet-uncounted ballots "inconsistent with Kansas law." He demanded in a letter to Kobach that Kobach stop advising county officials and have the state's attorney general do it instead.” Meanwhile, Kobach’s lead has shrunk from 191 votes to just 121. This has been getting very ugly, particularly because Kobach has built such a reputation around his warnings of frequent voter fraud. What we can’t figure out: How does this end? Is there any situation in which there’s an agreed-upon nominee without lawsuits? How does either candidate feel comfortable conceding? And can the GOP get a Republican candidate in time to have a real campaign in a governors’ race that is very much competitive? The party has to figure out how to fix this feud, but the president — who’s endorsed Kobach and helped elevate his national profile — isn’t exactly in a position to step in either. And yes, we are tempted to roll our eyes too. But we are also reminding ourselves to be careful of dismissing anyone who’s flirting with a presidential run, since, well, the last time the political press did that, Donald Trump proved them wrong. Memo to our fellow political reporters — before you poke fun at Avenatti, just ask yourself how much you mocked Trump when he first said he was running.